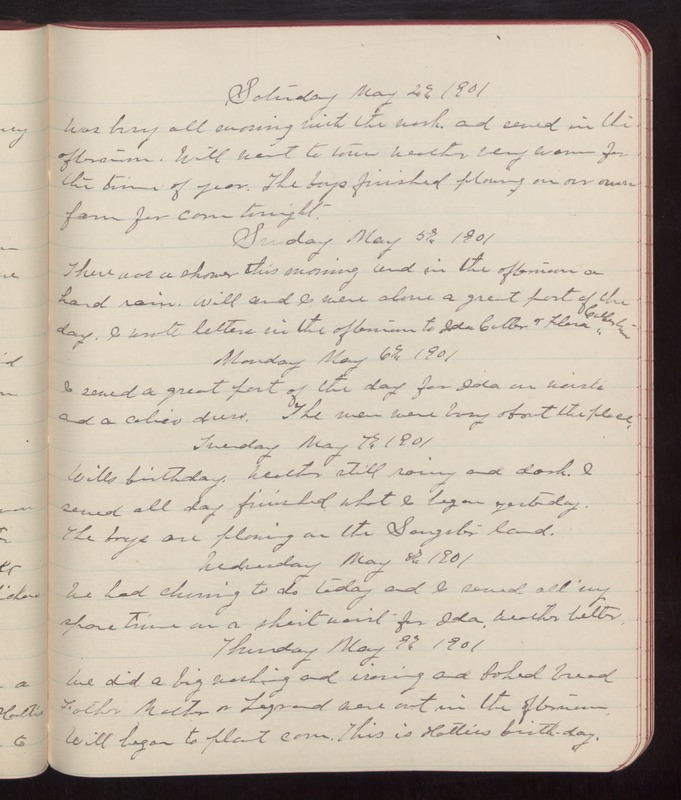 Saturday May 4th 1901 Was busy all morning with the work, and sewed in the afternoon. Will went to town Weather very warm for the time of year. The boys finished plowing on our own farm for corn tonight. Sunday May 5th 1901 There was a shower this morning and in the afternoon a hard rain. Will and I were alone a great part of the day. I wrote letters in the afternoon to Ida Cutter & Flora Culbertson. Monday May 6th 1901 I sewed a great part of the day for Ida on waists and a calico dress. The men were busy about the place. Tuesday May 7th 1901 Wills birthday. Weather still rainy and dark. I sewed all day finished what I began yesterday. The boys are plowing on the Sangster land. Wednesday May 8th 1901 We had churning to do today and I sewed all my spare time on a shirt waist for Ida. Weather better. Thursday May 9th 1901 We did a big washing and ironing and baked bread Father Mother & Legrand were out in the afternoon. Will began to plant corn. This is Hattie's birth-day.